Each year, more than 1 million people get treated for cancer, and most of these will undergo chemotherapy, radiation therapy, or both. This reassuring, optimistic guide helps people get a handle on treatment options and explains in plain English how chemotherapy and radiation therapy really work. It offers detailed advice on how to alleviate and cope with side effects-which range from hair loss to nausea to anemia-and describes how good nutrition, meditation, support groups, and other techniques and resources can help in the recovery process. Alan P. Lyss, MD, is a medical oncologist. Humberto M. Fagundes, MD, is a radiation oncologist. Patricia Corrigan is a professional writer and cancer survivor. Part I: Your Journey Through Cancer Treatments: Preparing for the Trip. 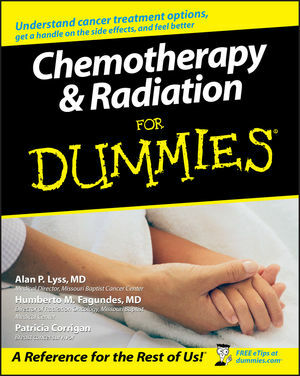 Chapter 1: Recognizing the Realities of Chemotherapy and Radiation. Chapter 2: The Mutants Take Over: A Primer on Cancer. Chapter 3: You Will Be Tested: What All Those Tests Show. Part II: Your Choices along the Way: Making Good Ones. Chapter 4: Defining Chemotherapy: The Anticancer Drugs. Chapter 5: Defining Radiation: A Burning Issue. Chapter 6: Setting New Standards: The Role of Clinical Trials. Chapter 7: Getting a Second Chance: Bone Marrow Transplants. Part III: Chemotherapy: What to Expect and How to Deal with Side Effects. Chapter 8: What to Expect During Chemotherapy: A Head-to-Toe Mouthwash. Chapter 9: Gimme a Boost: Immune and Bone Marrow Stimulants. Chapter 10: Coping with Serious Side Effects of Chemotherapy. Chapter 11: Coping with Less Serious Side Effects of Chemotherapy. Part IV: Radiation: What to Expect and How to Deal with Side Effects. Chapter 12: What to Expect During Radiation: Tattoos and Moisturizer. Chapter 13: Coping with Side Effects of Radiation Therapy. Part V: Your Success Strategies: Assembling Your Support Team. Chapter 14: Your Health Professionals: Your Friends and Guides. Chapter 15: Good Nutrition: Eating Right No Matter How You Feel. Chapter 16: Meeting Spiritual Needs: Turning to Prayer and Meditation. Chapter 17: Finding a Support Group: Realizing You Are Not Alone. Part VI: Your Future after Cancer Treatments: Looking Ahead. Chapter 18: Finishing Therapy: An End and a Beginning. Chapter 19: Dealing with Recurrence: Here We Go Again. Chapter 20: Defining Yourself after Cancer: The New Normal. Chapter 21: Ten Myths about Cancer. Chapter 22: Ten Ways for Family and Friends to Help You. Chapter 23: Ten Things Beyond Your Control. Chapter 24: Ten Ways Life Will Be Better after Cancer. Chapter 25: Ten Sources for More Information.